Do you want to install the Best Comic App for your iPhone or iPad ? Here we’ve listed 8 best comics apps for iOS devices which would be very useful for comics lovers. If you love reading comics, must check these useful apps. 1. Comic Zeal Comic Reader – Comic Zeal is one of the best comic apps which help users to read their favourite comics easily from their iPhone or iPad. This app has many useful features which can help you to read your favourite comics easily from your iPad and iPhone. With this app, you can turn your device into a comic library. Comic Zeal helps you to organize hundreds of comics by series so that you can search and find them easily from your device. When you finish one comic, it automatically opens the new one. Great app for comics lovers which comes with lots of options. 2. iComics – iComics is a great comic app for comic lovers. If you enjoy reading comics, you would love this app. The app comes with many features with a clean interface and supports almost all comics formats. The app lets you organize sets of comics as collections. 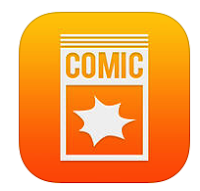 iComics is a great way to read your comics conveniently on your iPhone and iPad. 3. Comicbook – Comicbook is a fully featured comics app that entertains users by turning them into comic heroes and villains. The app has realistic comic user interface with lots of interesting features including a library of classic comics. Comicbook comes with lots of useful options that could be very useful for comic lovers. Check out this great comic app on your iPhone or iPad. 4. Madefire – Madefire is one of the best apps of the Appstore that are available free of cost. This is a free comic application which lets you read your favourite comics with a nice interface. You can discover original comics using this great app. Episodes are free during the initial release period. You can read comics with 360° panoramic views, sound effects and music. 5. ComicGlass ( ComicReader ) – ComicGlass a nice comic viewer to read your favourite comics, manga, magazines and books on your iOS device. ComicGlass lets you view scanned comics, manga, magazines and books with a nice interface. You can also transfer your scanned images from your computer to your iPhone or iPad. One of the best comics reading apps for iPhone and iPad. 6. Dark Horse Comics – One of the best free comics apps for iPhone and iPad and it lets you read your favourite Dark Horse comics at your fingertips . The app has beautiful user interface that can help iPhone users to read comics easily from their device. 7. Simpsons Comics – If you love reading Simpsons comics, this app for you. You can install this app free of cost on your iPad or iPhone. You can read your favourite comics by downloading paid and free comics. 8. Marvel Comics – Marvel Comics app lets you read hundreds of favourite comics books. You can find here world’s most popular super heroes such as – Spider-Man, Iron Man, Thor, Captain America etc.